Dear knitters, it’s time for the Autumn Mini Swap over in the Carol E Herman Designs group on Ravelry! For this swap, participants will knit, crochet or sew a handmade autumn-themed item for their swap partner and will send a small (under $5) gift with it. Autumn…..sigh…..I have so much love for this season. Pumpkins, candy corn , crisp air, apples, apple pie, maple candy, glorious color, fall migration….. My list could go on FOREVER. This mini swap celebrates friendship and the beauty of the Fall season. In this swap you will send your secret swap partner a lovely knitted, crocheted or sewn gift reminiscent of Autumn. You can read all about it here. The important things to know are that sign-ups end September 5th and our mailing deadline is October 3rd. 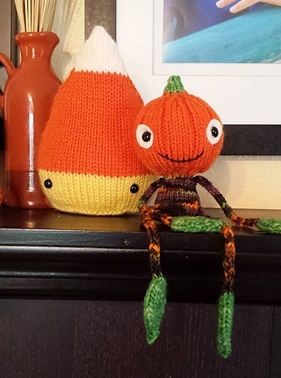 Jen’s Patch and Candy Corn – Aren’t they adorable? Our swaps are so much fun: such a great way to get to know other knitters, to create a lovely gift, and to look forward to receiving a surprise in the mail. Here is the post I wrote after the end of our last swap. I hope you will consider joining us! Carol, I’m so glad you posted this because I always forget to check out my groups’ other threads. I tend to just check the ones I’m following. Thanks, Stefanie, I’m so glad you’re joining the swap!